Specifically designed to cater to the US market, ACR3801 is an FIPS 201-compliant contact smart card reader utilizing the latest technology. With an elegant design and capability to support high speed transactions, ACR3801 is ideal for a broad range of smart card solutions, including, Public Identity Verification (PIV), Physical and Logical Access Control, Digital Signature, Online Banking, and others. 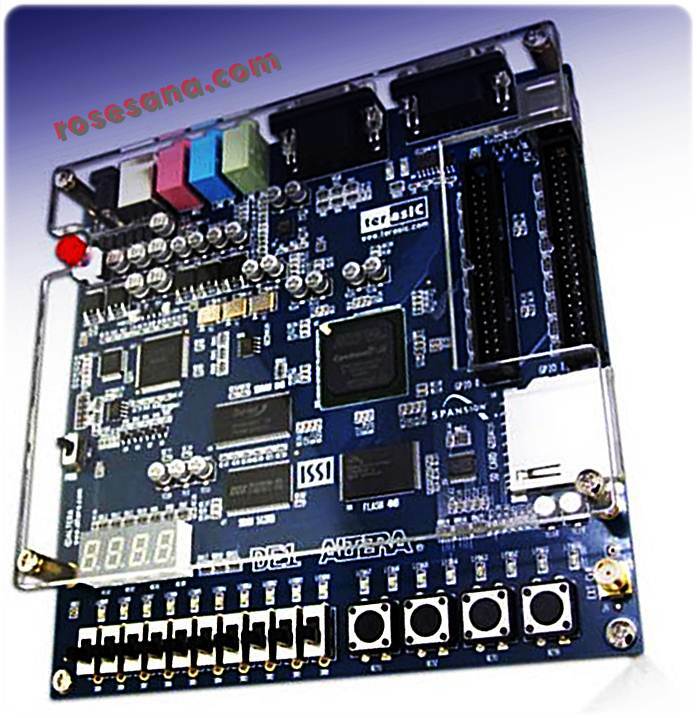 ACR3801 supports ISO 7816 Class A, B and C (5V, 3V, 1.8V) smart cards and microprocessor cards with T=0 and T=1 protocol. It also supports a wide variety of memory cards in the market, including the Common Access Card (CAC), a U.S. Department of Defense (DoD) smart card issued as standard identification for active DoD personnel and other non-DoD government employees. A reader that does not compromise look for performance, ACR3801 is a heavy-duty reader built for demanding smart card operations. 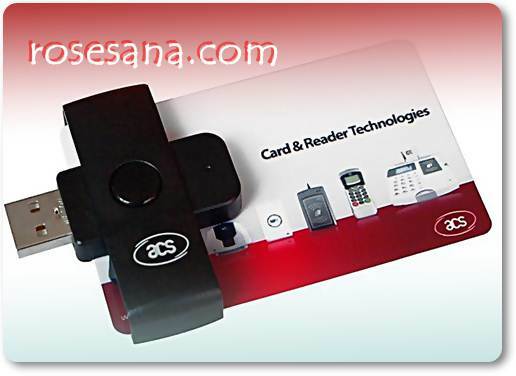 The ACR38U PocketMate is a smart card reader that is more than what meets the eye. As lustrous and elegant as it is, this smart card reader is reliable that it operates full sized cards with its small frame. 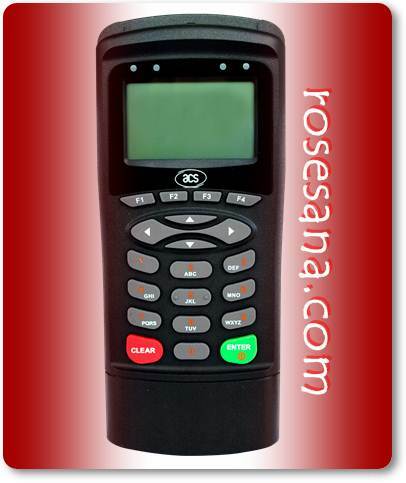 With the latest technology combined with fresh look, the ACR38U PocketMate is designed to meet your security needs in using it in different applications, such as in E-Banking, E-Payment, Transportation, and E-Government. The ACR38U PocketMate supports ISO 7816 Class A, B, and C smart cards (5V, 3V, and 1.8V). 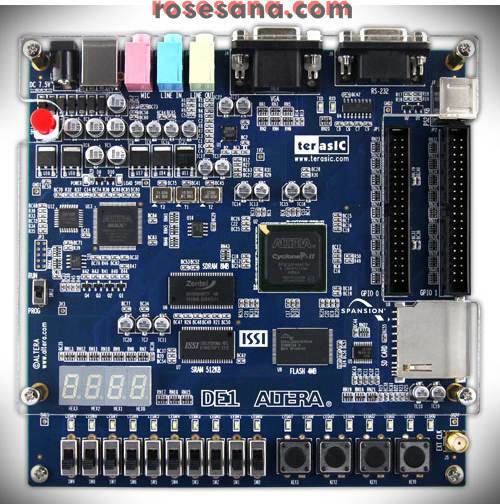 It also supports microprocessor cards with the T=0, T=1 protocol and most memory cards in the market today. 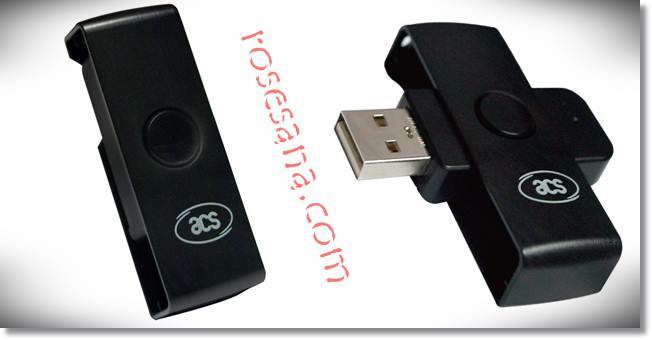 The ACR38U PocketMate has a USB full speed interface and a smart card read/write speed of 344 Kbps. The ACR38U PocketMate is designed to be brought anywhere as it comes in a very compact size. You just need to swivel the outer casing to be able to use it. This small device proves to be a powerful smart card reader as it houses the ACR38 core, which has been proven to support highly demanding smart card applications. Being PC/SC and CCID compliant device, the ACR38U PocketMate is easy to install and use as it is specifically designed to be integrated in a PC environment. Its drivers are compatible with Windows operating systems as well as Linux and Mac OS. ACR33U-A1 SmartDuo is a sleek and stylish device that features an innovative dual smart card slot solution for cost-effective, time-efficient and secure implementation of smart card applications in fields such as e-Banking and e-Payment, e-Government, e-Healthcare, Physical and Logical Access Control, and Network Security. It supports ISO 7816 Class A smart cards, microprocessor cards with the T=0 and T=1 protocol, and most common memory cards in the market. 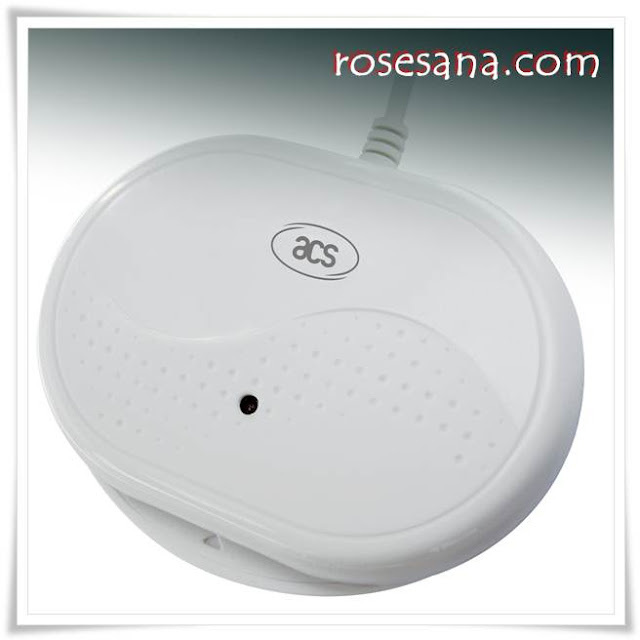 It has USB full speed as its host interface, and a smart card R/W speed of 344 Kbps. 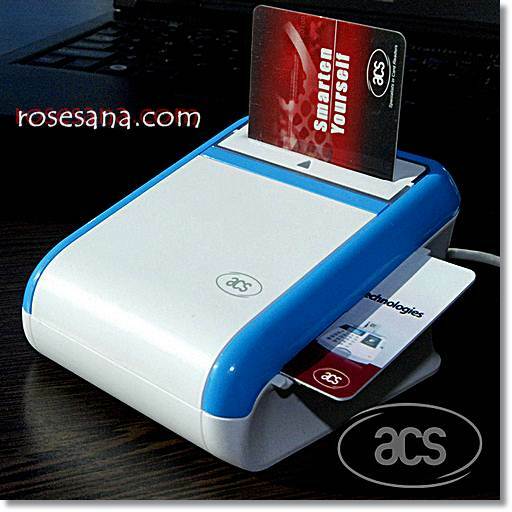 With dimensions of 103.5 mm x 85.0 mm x 59.9 mm and capacity for at least 200,000 card insertion cycles, ACR33U-A1 SmartDuo is a highly portable and durable smart card reader. ACR33U-A1 SmartDuo’s dual slot feature allows users to operate two full-sized smart cards at the same time, enabling efficiency and enhanced security in smart card applications. 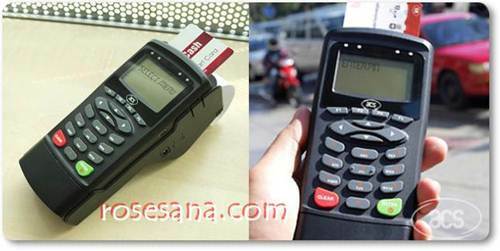 As an example, one slot can hold the smart card of an authorized personnel managing a particular smart card-based service, while the other slot can be used by various individuals availing of such service. Through ACR33U-A1 SmartDuo’s dual slot solution, the need to pull out and reinsert the personnel’s card to accommodate a user’s card, whenever one is presented, is eliminated, resulting to smoother and uninterrupted flow of transactions. Aside from its dual slot feature, ACR33U-A1 SmartDuo also has 3 SAM (Security Access Module) card slots. 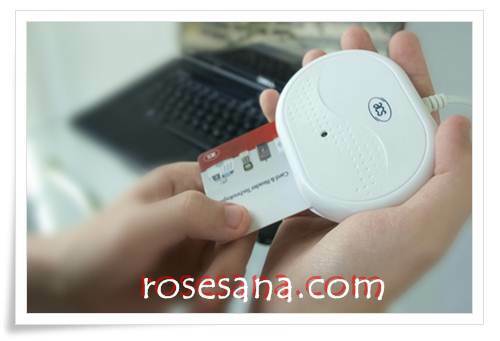 This feature allows one to enhance the security provided by the device for applications requiring more stringent security mechanisms. 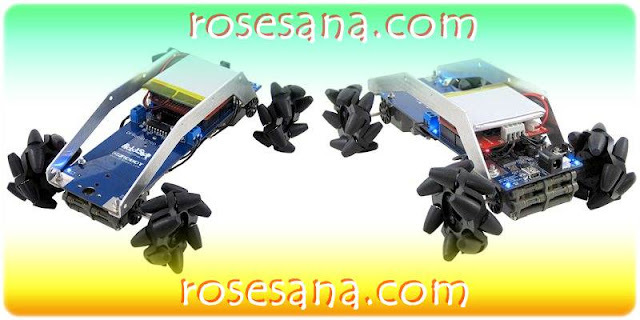 Mecanum Rover 2.0 Robot (Basic Kit) - Arduino Compatible is a versatile mobile robot based on the popular Arduino Uno microcontroller. The Rover uses two Tamiya twin motor gearboxes, each with their own pair of encoders, as well as a dual motor controller shield** to control the four Mecanum wheels independently. The DFRobotShop Rover PCB incorporates a standard Arduino Uno (surface mount ATMega328), L293B motor driver (connected to pins 5 to 8), voltage regulator and prototyping area and also doubles as part of the mechanical structural of the robot. The onboard voltage regulator allows the entire board to be powered using as little as 3.7V to ~9V*. 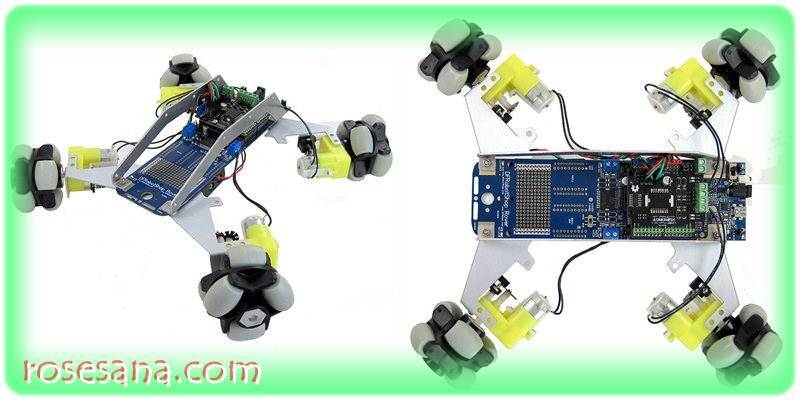 ** The Mecanum Rover 2.0 Robot (Basic Kit) - Arduino Compatible PCB incorporates a dual motor controller, and the shield adds a dual controller which uses different pins, allowing you to control four DC motors independently. The DFRobotShop Omni Rover 2.0 Kit (40mm Wheels) is a versatile mobile robot based on the popular Arduino Uno microcontroller. 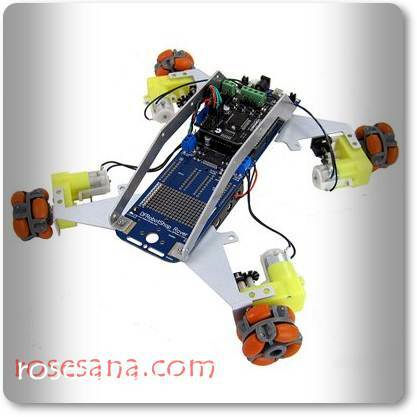 The Rover uses four DC gear motors with encoders which allows for independent control of all four omni-wheels. The DFRobotShop Rover PCB incorporates a standard Arduino Uno (surface mount ATMega328), L293B motor driver (connected to pins 5 to 8), voltage regulator and prototyping area and also doubles as part of the mechanical structural of the robot. The onboard voltage regulator allows the entire board to be powered using as little as 3.7V to ~9V*. The motors included with this kit operate at 6V nominal and as such we suggest using 4xAA (Alkaline has the robot move faster than when using NiMh) or a 7.4V LiPo (note that the onboard charger can only charge 3.7V). The DFRobotShop Rover 2.0 Arduino Compatible Robot builds upon the success of the first generation DFRobotShop Rover and integrates a LiPo charger (charges via USB), solder prototyping area, XBee footprint and more. • DFRobotShop Rover incorporates dual H-bridge for bi-directional motor control (digital pins 5, 6, 7 and 8) while motor shield (also L298P) uses pins 10 to 13. The DFRobotShop Omni Rover 2.0 Kit (60mm Wheels) is a versatile mobile robot based on the popular Arduino Uno microcontroller. 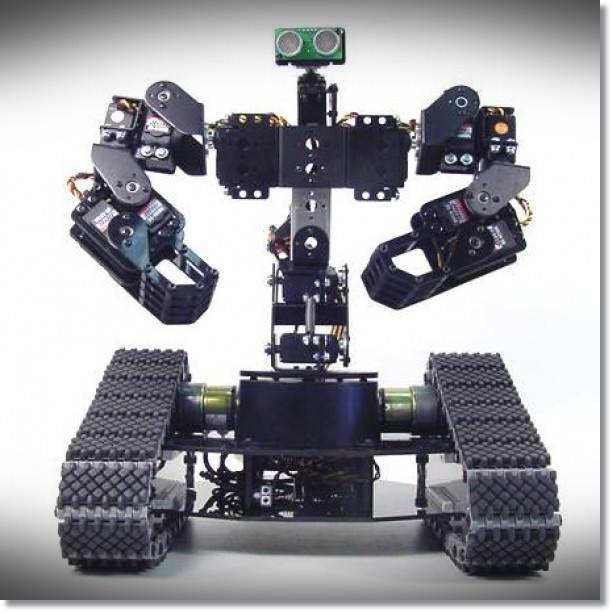 The Rover uses four DC gear motors with encoders which allows for independent control of all four omni-wheels. The DFRobotShop Rover PCB incorporates a standard Arduino Uno (surface mount ATMega328), L293B motor driver (connected to pins 5 to 8), voltage regulator and prototyping area and also doubles as part of the mechanical structural of the robot. The onboard voltage regulator allows the entire board to be powered using as little as 3.7V to ~9V*. The motors included with this kit operate at 6V nominal and as such we suggest using 4xAA (Alkaline has the robot move faster than when using NiMh) or a 7.4V LiPo (note that the onboard charger can only charge 3.7V). The larger 60mm wheels translate to faster speed, though the weight gain reduces the battery life. The combo kit includes the powerful Lynxmotion Sequencer Program for PC. You can control the robot from a PC with the included DB9 cable, or use DFRobot bluetooth/APC220/Xbee modules for wireless PC control. 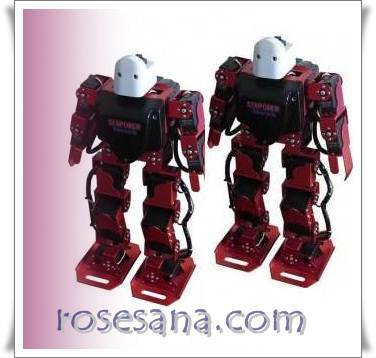 SHR-8S Special Training Humanoid Robot is a 17 degress of freedom robot which is designed espicially for the beginner. 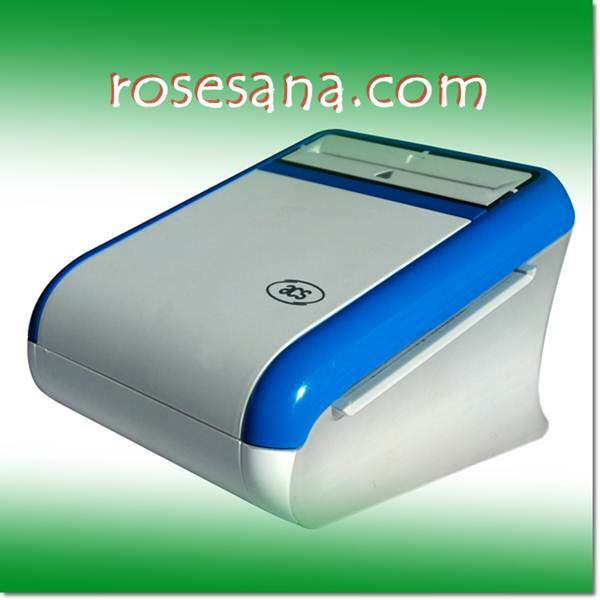 It has a firm structure and its software is easy to use with its diagrammatic motion edit user interface. The Robot can demostrate standard and non-standard Irvine Kinneas Walk.The Robot can demostrate plenty of hominine movement as push-up, forward roll, backward roll and headstand. 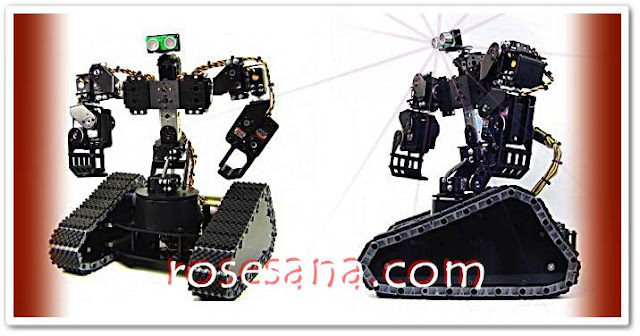 SHR-8S Special Training Hominine Robot is best for primary scholar and middle school student. Expert users can add severial additional sensors to the robot, such as luminous intensity sensor, temperature sensor, sound transducer, IR sensor, etc. The robot can worked with a machine vision systom to fit the Robo Cup's subhuman group's demands. Output torque: 14kg•cm(with standard 7.4v battery). Size of foot: 110×70×8mm (increasing hollow structure, easier for high speed walk). The first Arduino board based on a 32-bit ARM core microcontroller. 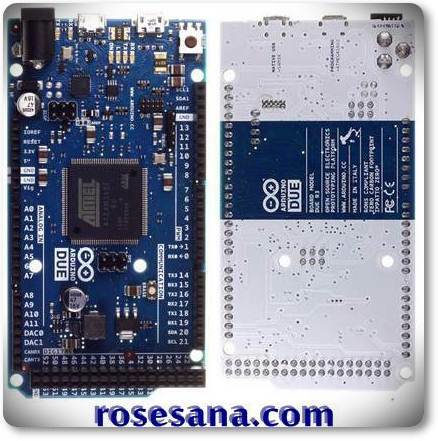 Arduino Due is a microcontroller board based on the Atmel SAM3X8E ARM Cortex-M3 CPU, It has 54 digital input/output pins. (of which 12 can be used as PWM outputs), 12 analog inputs, 4 UARTs (hardware serial ports), a 84 MHz clock, an USB OTG capable connection, 2 DAC (digital to analog), 2 TWI, a power jack, an SPI header, a JTAG header, a reset button and an erase button.